A former speech therapist who is fluent in Mandarin Chinese was ordained to the priesthood on Sunday to serve in the diocese of Derry. Thirty-three-year-old Fr Malachy Gallagher from Coleraine, Co. Derry is a former student of the Irish College in Rome and St Malachy’s Seminary in Belfast. His parents, Colum and Teresa Gallagher, his sister Lisa and brother Gerard attended the ceremony in St Mary’s Church, Drumagarner, Kilrea, Co. Derry. 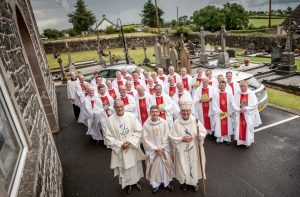 In his homily, Bishop Donal McKeown told the new priest that celibacy and simplicity of lifestyle are not the impositions of a harsh Church; rather they are an invitation from a loving God. 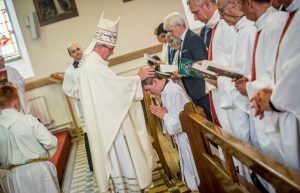 He urged the new priest to live “the sort of life that will inspire generous young people to do beautiful things for God” because today’s culture gives young hearts little to dream about. Dr McKeown told Fr Gallagher that his lifestyle would be a protest against the “stifling hedonism” that is presented as the best that can be hoped for. Ordination of Fr Malachy Gallagher. Pic courtesy: Stephen Lattimer/Derry Diocese. The Bishop of Derry urged his diocese’s newest minister to use his talents to bring people to Jesus and not to put himself in the way. His role as teacher, sanctifier and leader would involve “constantly getting your hands dirty and scarred”. On a sombre note, he also told the new priest that his ministry would often not be welcome because “Jesus’ message says that the world will not be saved by better laws, more things or new political units. The world will be healed by virtue in the human heart and not just by legislation in human parliaments. “Poverty and war will not be overcome merely by more collections, taxes or philanthropy but by the remaking of the human heart through grace. A New Ireland will never be created through political changes alone but when human hearts are softened. Fr Malachy Gallagher qualified as a speech therapist from the University of Ulster. He spent time as a seminarian for the Diocese of Derry in St Malachy’s Seminary, Belfast, and at the Pontifical Irish College, Rome. He then spent some years in formation with Divine Word Missionaries in Chicago and Taiwan. He has spent the last year as a deacon in the Parish of Templemore in Derry City.